Granny Miller has a book. 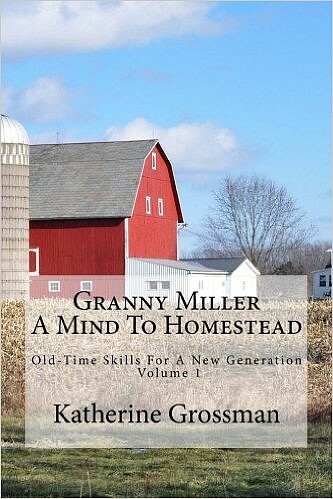 "Granny Miller: A Mind to Homestead"
I was so thrilled to see this. shares old-time agrarian knowledge based on experience. its release, and the hardcopy version is also available now. This is the first in an upcoming series on the topic of homesteading. I have never met Granny Miller. I actually asked her permission to write this post recommending this book. if I didn't truly believe it was worthy. There ~ now that that is clear. I did write a review which you can read here. We each have different views, needs, and desires leading us in multiple directions that would probably resemble a spider web if drawn on paper. Take a look at the contents. If any of those topics interest you, you won't be disappointed. the information is complete and well grounded. you might find it on her blog or in an upcoming volume. while appreciating that others still do it differently. readers and fellow bloggers are an extremely valuable resource. Being able to create a community through the internet is a gift indeed. Take a look and keep well my friends. PS (update) ~ if the link to her blog doesn't work, she might have taken it down. I know she was having a few health concerns. She takes it down if she can't manage it. Let's send up a prayer for speedy recovery and look forward to her return. If I were a whole lot younger I would love to be able to live in this manner. The book sounds like a good, and informative, read. THANK YOU ~ THANK YOU!! For bring this book to my attention. I've never heard of Granny Miller but did go to the link you posted for her book (and her blog). Oh my goodness - this sounds just perfect for me. I have already ordered the book and can't wait to read it. BY THE WAY.........I noticed that there were no reviews on her book. You might want to get on Amazon and leave a nice review for others to read. I know I will once I read her story. I'm also going to spend some time on her blog (she's off line or something right now), so will explore her archives. LOVE YOUR BLOG and intend to do some serious reading on your blog too. BTW: For the woman above me (Magpie's Mumblings): We just bought a run-down, foreclosure so-called farm (25.5 acres, an old, run-down Christmas tree farm) with an old barn falling down, etc. We are in our late 60s (much closer to 70 than 60s). We are getting plenty of exercise and are enjoying the challenge and hard work that this property will take to get it back in shape. We have no outside help at all. We've already taken out over 200 trees (including their huge stumps) with our tiny garden tractor and lots of hard, physical work. We have a 13-acre hay field that we have put a lot of work into it so we can hay it (ourselves) this year. We had to buy old, used equipment for haying and are looking forward to our first-EVER haying season. We have been taking down the old barn, and hope to rebuild a new one (ourselves) to store the hay. We are happy, healthy and tired at the end of the day but look forward to each & every day. Don't let age stand in your way!